Listening to a recorded course on Chinese history* a few months ago, I was struck by how descriptions of “gridlock” in the late Ming dynasty government of China sounded much like the US government in recent years. Typically, Americans draw comparisons – apt or not – with ancient Rome, but perhaps late Ming China (which fell in 1644) might also offer some cautionary lessons. Being neither an expert in Chinese history nor a student of Eastern philosophy, I am not in a position to comment in depth on this interpretation. 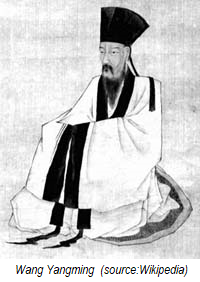 However, the influence of Wang Yangming’s moral intuitionism among the literati in China at that time, the inability of the government to grapple with multiple problems, and the ultimate end of the Ming dynasty, are all known facts. Recent politics in the US has been marked by extreme, intransigent positions, mainly on the part of an influential minority, and a tendency for two main partisan sides to talk less and even impugn the motives of the other. The influence of one particular thinker, Ayn Rand (1905-1982), on some members of the US government, is arguably a key factor in this devolution. This is admittedly a shallow comparison, but not much worse than many comparisons of the US and Rome. The advantage of looking at a range of possible past parallels to one’s current situation is in drawing lessons from them so as not to repeat history.